With our extensive backgroung in professional motorsports, including numerous wins, podiums, and championships; we have turned our focus to providing our customers with the highest level enhancements for their personal vehicles. Now, the average consumer has access to the same parts that top level racng teams use around the world! When we address the chassis and suspension setup of a customer vehicle here at TPC, we typically get a feel for the customer’s uses of their vehicle, and what they would ultimately like to achieve. We then build the customer’s car around those wishes, using professionally engineered parts to achieve the best chassis balance, in the most cost effective and appropriate way possible. With this thought in mind, we have developed several comprehensive “Stages” of suspension packages; each seeking a higher level of performance than the last, until we arrive at full race car setups in our Stage 4 Suspension Kits and beyond! The first level, the TPC Racing Stage 2 Suspension Kit, is the first step in achieving a vehicle with stable, predicatable chassis, while inspiring driver confidence. But why are sway bars so important? 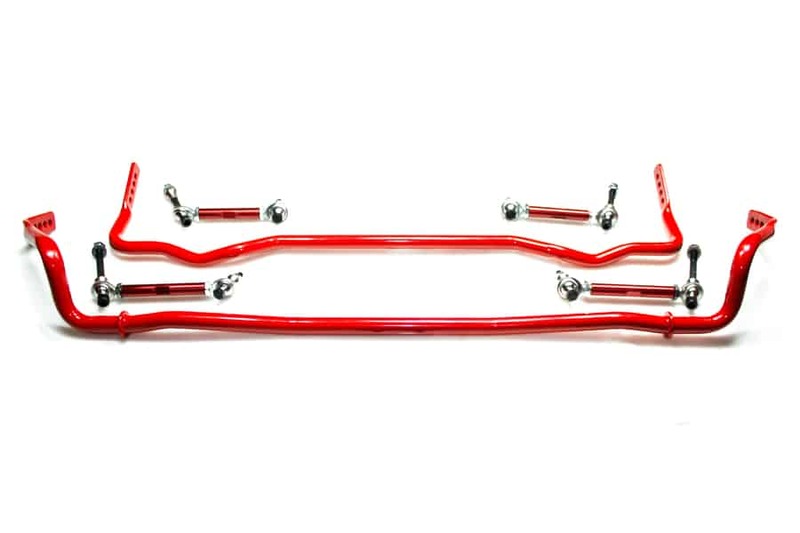 TPC Racing Adjustable Sway Bars, replace the factory units, with bars designed and tested on the street and track, on TPC Racing’s own test vehicles. After several thousand miles, several design revisions, and countless trips to the track for testing, we are proud to offer the absolute best sway bars on the market….”bar” none. 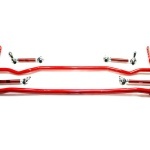 Sway bars are torsional springs that link the left and right sides on the vehicle’s chassis. Imagine making a hard right turn. As the vehicle turns to the right, you can feel the entire body of the vehicle, as well as your own, rolling towards the left. This is called “body roll”, and when it occurs, it results in a loss of traction to the inside tires, while that outside tires become overloaded and lose their effectiveness. Every modern vehicle has a pair of these bars; one for managing the front of the vehicle and the other for managing the rear. It is the sprig rate of these bars, and their balance relative to each other, that has the greatest affect on a vehicle’s driving dynamics. 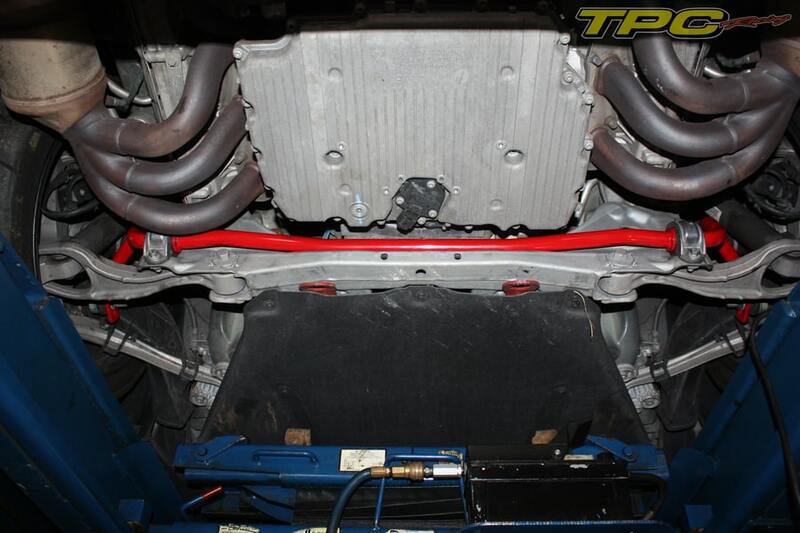 TPC Racing Stage 2 Suspension Kit upgrades the factory sway bars with TPC’s own units. The effect of this upgrade is that now, when driving through the same right turn, TPC Racing’s Sway Bars act to rebalance the car, putting more of the vehicle’s weight back onto the inside tires, while relieving the outer tires of some of their load. What the driver feels, is a vehicle that seems to have doubled it’s grip especially under hard driving conditions. 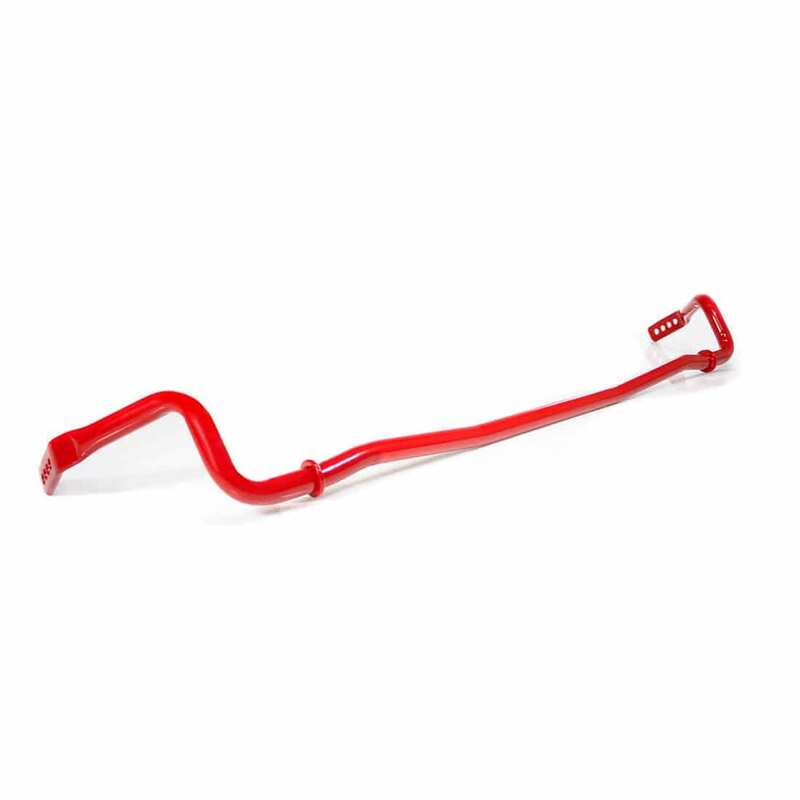 Whether carving up twisting mountain roads, or making a late race outside pass, TPC Racing Adjusable Sway Bars will help provide you the grip and confidence you need it most. In order to put up with the greatly increased loads generated by the TPC Racing Adjustable Sway Bars, the factory links must be replaced with our high strength units. 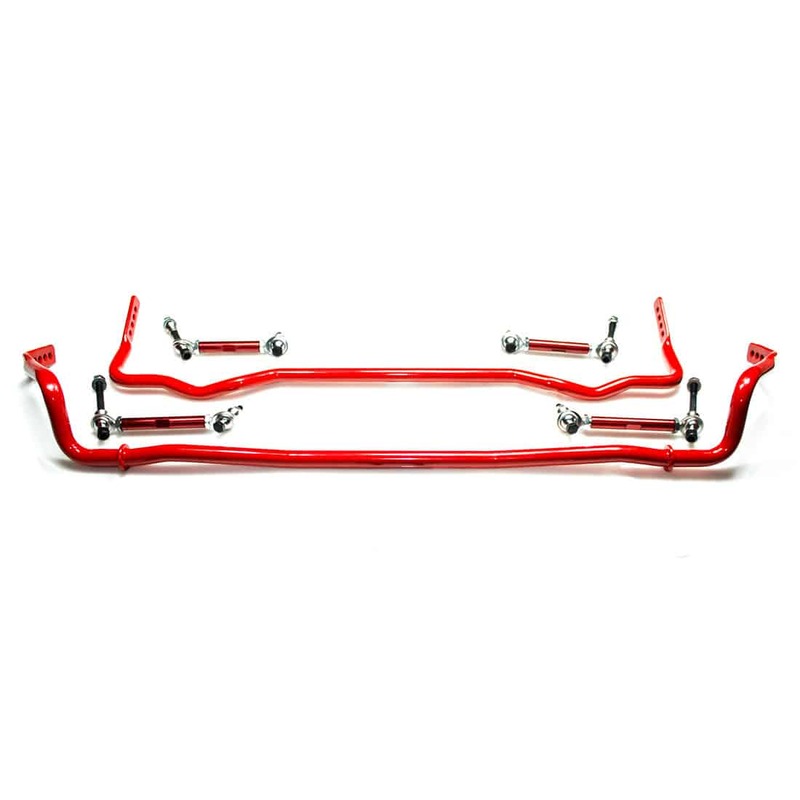 These upgraded links feature attrative, red anodized, high strength aluminum bodies, with performance bearings, designed to withstand greater cornering loads. These bearings are available with optional rubber boots, which can be filled with grease, in order to minimize squeaks experienced when moving at parking lot speeds. Proper suspension geometry is essential to creating a solid, predictable chassis. Once the stock vehicle has been lowered with more aggressive suspension setups, the chassis will often times lose its optimal geometry, which cannot be corrected with factory components. This is where the TPC Racing Adjustable Rear Toe Links come into play. These units serve multiple purposes, the primary being as a bumpsteer adjustment. With multiple shim thicknesses, TPC Racing Rear Toe Links allow for the correction of the rear geometry to eliminate any bumpsteer effects that may be present. With their solid, high strength, heim joints, the TPC Racing Adjustable Toe Links eliminate the rubber bushings of the stock units, providing the driver more consistent chassis feedback, espescially under hard cornering. “…In reading about TPC and giving them a call, I was convinced to give their swaybars, drop links, and toe links package a try. Tom Chan, TPC’s race team manager helped me (over the phone) with initial swaybar setup, alignment settings, and some subsequent tweaks based on my feedback from the track. I, too, am a weekend warrior who wants his Porsche to be a comfy, stylish cruiser and around-town fun car. I picked up about five seconds at the track (from 1:52 to 1:47 at MidAmerica Motorplex) and the car was much more controllable, predictable, and planted. And FUN! Amazing! TPC Racing Cayman/Boxster Stage 2 Suspension Kit is available for ALL Porsche Cayman/Boxster models(986, 987, and 987.2).